Place the sliced onions on a large sheet of aluminum foil, drizzle with olive oil and season with salt pepper. Seal the foil to make a packet. Place the foil packet on your backyard BBQ and fire up the grill to medium heat (the onions will begin cooking while the grill heats up!). Once the BBQ is hot, grill the Hoffy Hot Dogs until marked and heated through. Continue cooking the onions until they are tender and caramelized, about 15 minutes longer. To assemble the nachos, place the white and blue tortilla chips on a platter. Slice the grilled Hoffy Hot Dogs on the bias and scatter the hot dog pieces over the chips. 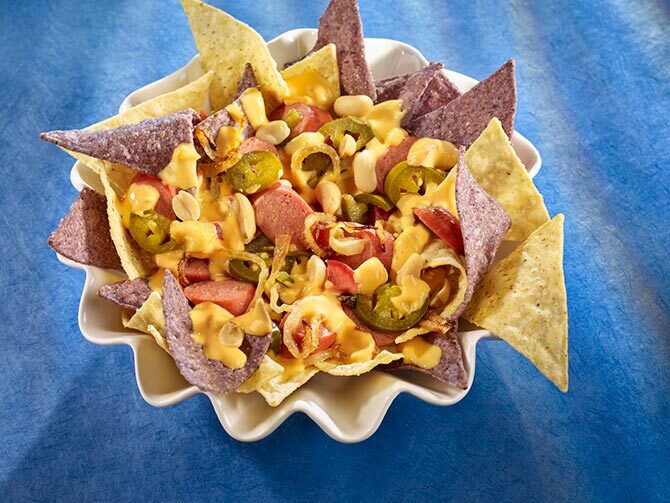 Top with the warm nacho cheese, the grilled onions, diced tomatoes, pickled jalapeños and garnish with peanuts.